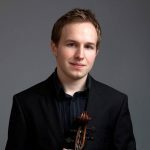 Fitz is a native of Charlottesville, Virginia, and has performed across the United States, Europe, and in Asia in such venues as New York’s Carnegie Hall and Avery Fisher Hall, London’s Royal Albert Hall, Vienna’s Konzerthaus, and Japan’s Suntory Hall. Fitz’s passion for chamber music has led to studies with members of the Artemis, Cleveland, Juilliard, Jupiter, Keller, Miró, and Takács Quartets. As a teaching artist, Fitz has been on faculty at the Bay View Music Festival, the Hampton Roads Chamber Players, taught in the Charlottesville High School Orchestra program as the Boyd Tinsley String Mentor, and given masterclasses and presentations to students of all ages. Selected as a 2013-2014 Fulbright Scholar, Fitz studied with Barbara Westphal at the Lübeck Musikhochschlule in Germany. The school subsequently awarded him the prestigious 2014-2015 DAAD prize for an outstanding international student, as well as his second masters degree. While in Germany, Fitz completed the Akademie with the Grammy-Award-winning NDR Sinfonieorchester (Elbphilharmonie) in Hamburg. Currently Fitz is a freelance musician based in Norfolk, Virginia. He performs regularly with the Virginia Symphony Orchestra, has performed on the Virginia Arts Festival, and serves as a clinician ambassador for D’Addario Strings.